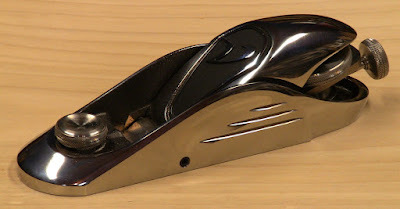 The Lee Valley/Veritas NX60 Premium Block Plane in repose. I call it the Starship Enterprise plane. It looks like it should be with the boys on Top Gear, sitting next to a Bugatti Veyron quivering under brakes after hitting the Launch button, poised to take on the Euro Fighter Typhoon. Or perhaps taking part in a beach assault with the Royal Marines. But is it Green? No. It's sleek liquid silver and black. What does it have to do with cars? Nothing. It's just gorgeous. Superb industrial design, check! Of course, simply looking good is not the measure of a woodworking tool. Like a supercar, it must perform. 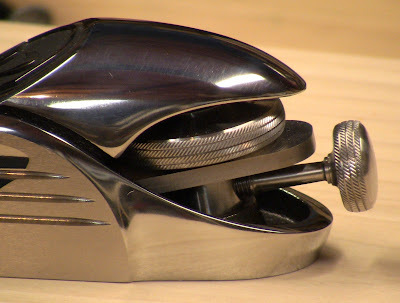 At $279, it's the most expensive production block plane on the market. However, that's just 1/5734th the price of a Veyron, so from that perspective it's well within the means of even the most penurious supercar enthusiast (though based on the ratio of the Veyron's 1020 brake horsepower to the roughly 0.1 hp sustained output of a human, the car is a better deal, dollar per unit of power). I'll just note that the Bridge City CT-17, another spectacular bit of industrial design, is $859, but that's a one-of-a-kind commemorative tool run (the Terminator called, it wants its body parts back). 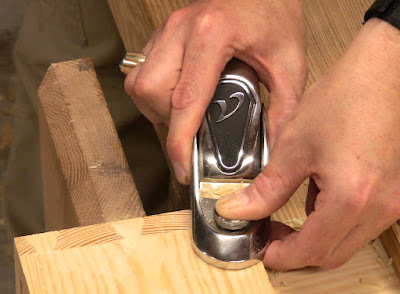 I was fortunate enough to be awarded a $250 Lee Valley gift card for a blog post that turned into a "Tricks of The Trade" item in the upcoming October 2010 issue of Popular Woodworking Magazine. You'll just have to get the magazine, but it goes to show you they cruise the web; my thanks to the editors! I scanned the Lee Valley website for a suitable purchase while awaiting the card's arrival. What better opportunity to buy an over the top premium plane? Frugality ain't in it! When the card arrived, I ordered the plane, kicked in the difference, and it arrived four days later (it was over the weekend, after all). Efficient shipping, check! The first thing I noticed after I stopped the bedazzled whirls in my eyes: this is a serious weight of metal. It would have answered handsomely in Jack Aubrey's long nines during a chase. 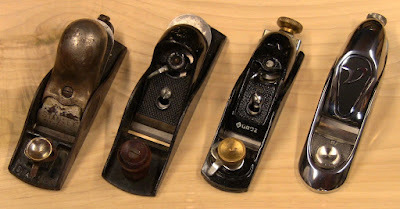 The nearest things I have for comparison are a Stanley #18, patent date 2-18-13 (adjustable mouth, normal angle), a Miller's Falls #75 (fixed mouth, normal angle) and a recent Groz (adjustable mouth, low angle). Putting the NX60 next to the Groz is a bit unfair. It's like putting the Veyron next to that green Ford Fiesta. Sure, it'll get you there, but it's just not in the same league. There's a 10:1 price ratio. 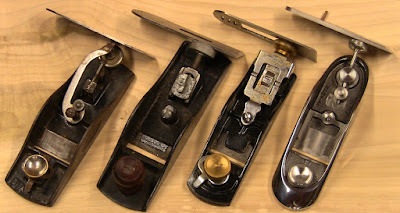 Like a Friday-night car show: Stanley, Miller's Falls, Groz, and Veritas block planes. Does that thing have a hemi? 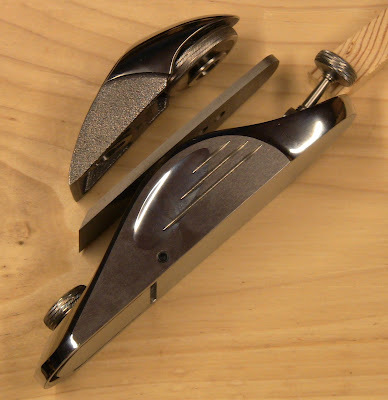 The NX60 has a 6 1/2" sole, 1 3/8" wide iron, and weighs 1 lb 12 1/2 oz. The Groz is 6 1/4" by 1 3/8", 1 lb 7 3/8 oz. The Miller's Falls is 7 1/8" by 1 5/8, 1 lb 6 3/4 oz. The Stanley is 6 1/4" by 1 5/8", 1 lb 7 oz. The NX60 is heavy, as I said, 21% heavier than the Groz, 23% heavier than the Stanley, and 25% heavier than the Miller's Falls. The fit and finish of the NX60 immediately stand out. 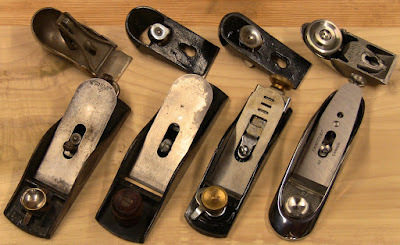 The NX60 lever cap has a somewhat lower profile than the other planes, making it fit in the palm a little differently. My favorite cap of the bunch is the Stanley. The bulbous shape fits comfortably in the hand, so if I have any quibble with the NX60 it might be for a slightly higher rear end. The iron is as precisely machined as the body. Note the large locking wheel in the lever cap. It locks down securely very easily. Even the lever cap screw is precisely fitted, with a bolster against the body. It takes a bit of force to snap the cap back and forth on it. Backing off the iron helps. 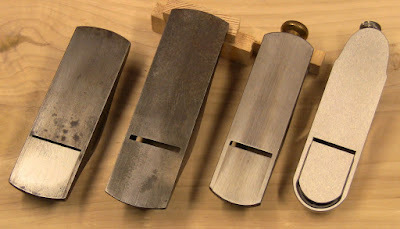 The NX60 iron is twice the thickness of the others. This makes it stiffer to resist chatter. The bearing surface of the bed is long and precisely machined, again helping resist chatter. The iron adjustment mechanism is heavy, secure, and precisely machined (notice a theme here?). None of this is going to bend. That can't be said for some of the others. There are no cheap stampings. The sole of the NX60 is precisely machined; the literature says to .0015" tolerance. The others have varying degrees of flatness and smoothness, and could benefit from cleanup on some sandpaper on a reference plate. You wouldn't think of doing that with the NX60. The toe plate is fully housed in the body casting. It won't jam against the edge of the iron if you hit something while planing. Breakdown. 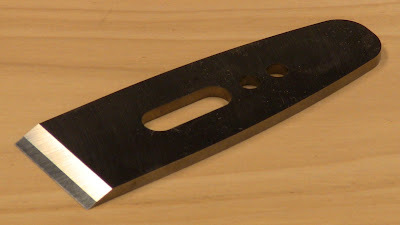 The blade advance is also the lateral adjustment pivot. Just visible in the photos are set-screws for lateral adjustment and mouth openings. These act as guides for maintaining settings. Now we see where it really counts. 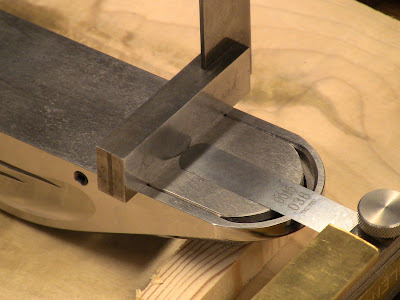 Sole and toe tolerance of the Groz: the .003" gauge fits under the machinist's square. Tolerance of the NX60: the .0015" gauge has no room. 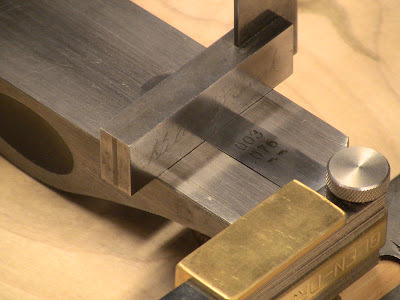 The precise toe plate tolerance means that when you want to take a really fine shaving, you can do it. The others simply can't reach that level of fineness. Closeup of the adjustment mechanism and cap screw, with very little backlash. This adjustment mechanism reminds me of the system on the Lie-Nielsen shoulder plane (based on the original Record design). It allows very quick, easy, and precise adjustment with secure lockdown. Need to adjust the depth of cut by a quarter turn? You can do it fast and trust it, without worrying about the iron shifting. I couldn't leave well enough alone, I gave the iron 5 strokes each side on a strop with green rouge. But it's ready to go out of the box, 25-degree primary bevel, 27-degree microbevel, and 23-degree relief bevel on the heel to reduce the amount of work necessary when regrinding the primary. With the 12-degree bed angle, that's a total cutting angle of 39 degrees. I know next nothing about metallurgy, but like the Veyron, the NX60 uses advanced materials, contributing to its cost. The literature that comes with it says the body is cast from nickel-resist ductile iron, which is more durable than grey iron, and the nickel gives the alloy the corrosion resistance of stainless steel. All the turned parts are stainless steel. In use: cleaning up end grain on a dovetailed corner using a two-handed grip. Unlike the Veyron, the NX60 relies entirely on manual traction control. Its mass feels authoritative in the hand, giving it the momentum to carry smoothly through end grain and small smoothing tasks with minimum chatter. I'd like to see the Stig take a few corners with it! Superb materials, check! Superb workmanship, check! The precisely ground fit and finish throughout, the high-quality materials all add up. Is this plane worth 10 times the cost of a cheap plane? Ask me again in 20 years, but I would say in general yes. They started out with better materials and spent more time and effort in manufacture. 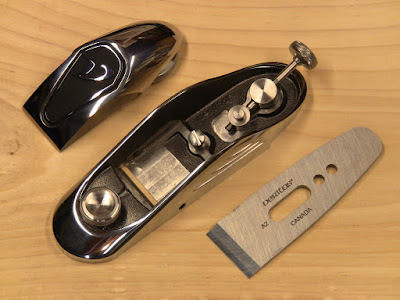 You'll spend far less time getting this plane ready to use (how long does it take to open a box? ), and you'll spend less fidgety time using it. The time savings over that 20 years or more (you won't need to replace it due to wear and tear any time over the next century) will outweigh that initial investment, providing a good return. And a 10x premium isn't so bad. The Veyron is 120x the cost of a Fiesta. So in that respect, the NX60 is a significantly better deal. Be sure to make that clear to your spouse when explaining why you should own one. Nice review, Steve. Based on a similar argumentation concerning the average cost over the next 20 years, I helped myself to the DX60 block plane. That's less fancy than yours, but still my best plane. And I didn't regret it at all. And congratulations to that Tricks of the Trade- Article!